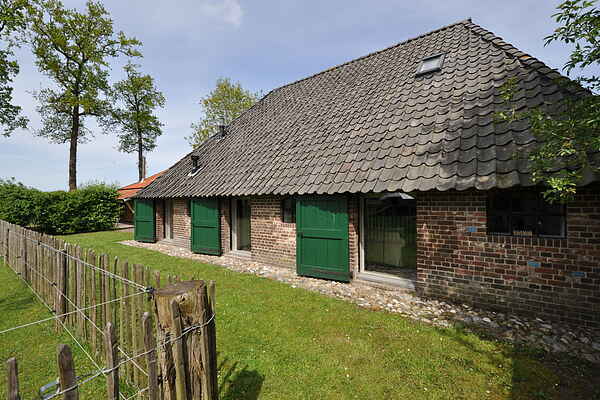 A detached 6-person accommodation in the Nieuwleusen countryside in a rural and modern style. The stylish interiors will make you feel like you've stepped into a home design magazine. This accommodation has the luxury of two bathrooms and a sauna. The living room has a charming ambience thanks to its old wooden beams, the gas fireplace in a cosy sitting area, the lovely staircase and the modern kitchen. You can make delicious coffee with the Nespresso coffee maker. On the ground floor you will find a bedroom with an en suite bathroom. There is also a separate bathroom with a bathtub, a shower and a sauna. The staircase provides access to the loft, where you will find the other two bedrooms. French doors lead to the terrace with a view of the pasture, where you will see goats and chickens. There is also a covered bicycle storage area where you can park and charge your e-bike. This holiday home is located in the Nieuwleusen countryside, a forested area close to the Vecht River, where hiking and biking enthusiasts will be in their element. Nieuwleusen, Staphorst, Dalfsen and Ommen are close by and if you fancy a bit more culture you can always visit Zwolle or Meppel. A daytrip to Giethoorn is also possible from here. For kids, a visit to Adventure Park Hellendoorn is a nice day out.